Yesterday morning I read this book and I finished it in one sitting. This morning I read it all over again. Tomorrow I'll probably do the same. Lately I have fallen in love with Gaiman, his way with words and his imagery, the dark twist in his fairy-tales and the many references to classic books and times long past. He puts his voice into his writing, and to read one of his books is to hear him speak out loud, clearly and real. I will always remember his books as being original pieces of imagination. I always describe them as 'original' or 'brilliant'. But this book is something entirely different. It is sincere and it is beautiful. This is not a story for children, but it is a story of childhood. It is a story of remembrance, but it does not involve nostalgia. It is a story of repressed memories, a story of childhood traumas and the stories we tell ourselves just to get through. "The Ocean at the End of the Lane" is impossible to categorize. It is a fantasy-novel, but it isn't the kind of fantasy-novel you would expect from Neil Gaiman. It is an elegiac myth, it is magic realism and it is something entirely undefinable. 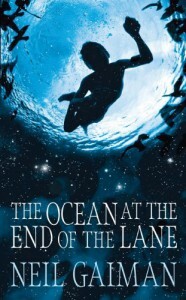 On the front cover the publisher claims that "'The Ocean at the End of the Lane' is a fable that reshapes modern fantasy", and I have to agree, as I cannot put it any clearer myself. Reading this book felt very personal, very intimate. Gaiman reminded me of something I had long forgotten, a profound truth I have carried with me in the hidden corners of my mind for many, many years. This story took me on a journey I'd never expected, and I left my heart somewhere between the pages. It moved me - and perhaps it even changed me a bit. Some of the quotes in this book felt like pieces of my own childhood, and I guess they will do the same for any child who has ever wandered off and seeked refuge in a fictional world. Gaiman's writing is wonderful, almost lyrical. There's a hint of melancholy and regret, and glimpses of something that almost looks like Gaiman's own memories. The plot itself is peculiar and odd, and so, so, so lovely. I would have liked to give this book ten thousand stars. I would have liked to let it stand out from my other favorite books, as the title suddenly feels insufficient. But as it is impossible, let me just repeat one simple phrase to sum up my feelings: this book is beautiful.